Above: Common Blue Camas flowers in a damp meadow in the foothills of the Rocky Mountains. This beautiful blue star-shaped lily is found in America and it ranges from British Columbia to Alberta and south to Colorado and California. 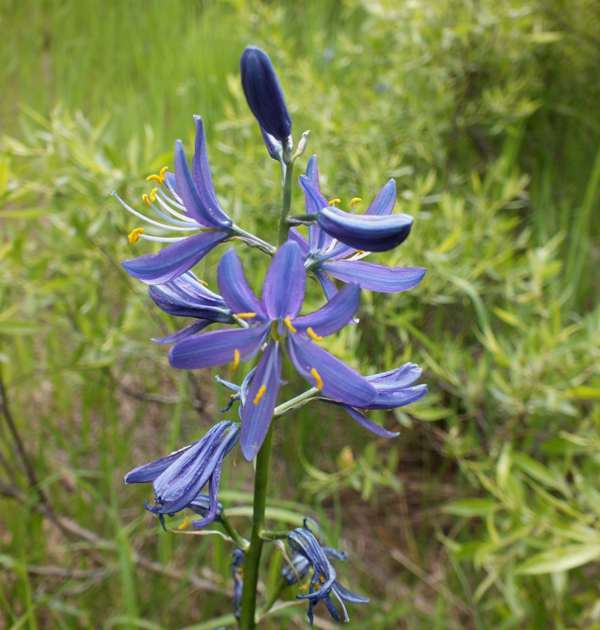 Blue Camas flowers in June and grows to around 60 cm in height. It grows in damp meadows and can turn large field areas from green to blue at its peak flowering time. The bulbs of this plant were collected by the American Indians and were either freshly cooked or dried and stored for later use as food. Confusion can arise when the bulbs are confused with those of Elegant Death Camas, Zigadenus elegans which are deadly poisonous. This mistake proved deadly for newly arrived settlers in America who were driven to forage for wild plants in a desperate attempt to stave off starvation. The specimen on this page was photographed close to Yellowstone National Park in mid-June.